How Does the ‘Mother of All Bombs’ Compare to the Largest Bombs of WWII? HomeDailyWWIIHow Does the ‘Mother of All Bombs’ Compare to the Largest Bombs of WWII? This Thursday, the United States dropped the MOAB in anger for the first time. But just how big is the largest conventional bomb in the USAF's arsenal? It’s called the GBU-43/B Massive Ordnance Air Blast, nicknamed the Mother of All Bombs, and it is the largest non-nuclear bomb currently in the U.S. Air Force’s arsenal. For years, America’s MOABs have lain dormant: the high potential for collateral had kept the weapon out of action, with smaller and more precise JDAMs and Hellfire missiles preferred against insurgent forces that intermeshed with civilian populations. On April 13, 2017, the USAF broke this trend by dropping one of these massive weapons on top of ISIS positions in Afghanistan. Just how powerful is the MOAB? The MOAB weighs 22,600 lbs, filled with 18,700 lbs of explosives. Its blast radius is 1 mile and yield is equivalent to 11 tons, or 22,000 lbs, of TNT. For a sense of scale, let’s compare the MOAB to the most destructive single weapon systems of the Second World War. The Grand Slam bombs were the largest conventional bombs of the war. The 22,000 lb bomb carried 9,000 lbs of explosives with a 13,000 lb yield. Delivered by modified Lancaster bombers, the Grand Slam, along with the smaller Tall Boy of similar design, was a deep penetration bomb intended for use against hardened structures such as railway bridges and submarine pens. By the end of the war the Allies would drop 41 of these bombs dropped on targets in Germany, mainly bridges and viaducts. Compared with the MOAB, the Grand Slam of course still falls short, with a yield of less than 60% of the MOAB’s. How Many B-29s Would It Take to Match a MOAB? The B-29 boasted perhaps the largest standard bomber payload of the war. When armed with 40 AN-M64 500 lb bombs, the B-29 had a devastating 20,000 lb payload. When loaded with 267 lbs of TNT, the 40 AN-M64’s made for a total TNT weight of 10,680 lbs. As such, it would take two fully loaded B-29 Superfortresses equipped with 80 AN-M64 bombs to match the firepower of one MOAB. B-29 bombers flying a daylight mission to Japan. How About Germany’s Heavy Bombers? Germany’s bombers would not even come close to the destructive power of a MOAB. These were far lighter than their Allied counterparts, owing to Germany’s blitzkrieg doctrine emphasizing light and medium bombers to provide coordinated support for fast-moving tanks and mechanized infantry. The only German purpose-built strategic bomber of the war to see significant wartime use was the He-177 Ural bomber. When equipped with six 2,209 lb SC1000 bombs, the He-177 could carry a maximum payload of over 13,000 lbs. With L2 bombs, the SC1000 variant with the most efficient weight to charge ratio, the Ural bomber could carry 7800 lbs of explosives. Thus, to match the firepower of one MOAB, it would require three of Hitler’s heaviest bombers loaded to their maximum payload. Compared to the MOAB, Hitler’s Wunderwaffe were even more outgunned than his Luftwaffe. The V2 rocket had a 2,150 lb warhead filled with 2,010 lbs of explosive amatol 60/40, an amazing 93% weight to charge ratio, but far short of the MOAB yield. It would take 11 V2 rockets to equal the destructive power of one MOAB. 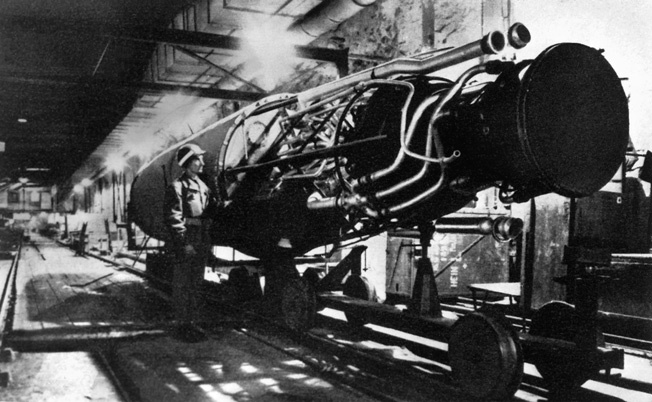 An American soldier inspects the engine of a V-2 pilotless rocket bomb on the assembly line at the underground factory near Nordhausen. The massive 800mm Schwerer Gustav railway gun, with high explosive shells weighing up to 10,600 lbs, only had an explosive weight of 1,500 lbs, meaning that the mighty Gustav would have to lob nearly 15 shells in order to match the destructive capabilities of one MOAB. This would be approximately equivalent to the average daily rate of fire for the Gustav of about 14 shells a day during the siege of Sevastopol. If the MOAB had been in World War II, it would have reigned supreme as the most powerful single weapon system of the war. That is, up until 8:12 a.m. on August 6, 1945. On that day, the world was formally introduced to a scale of destruction never before created by man. The Little Boy uranium bomb produced a blast estimated to be between 13,000-20,000 TONS of TNT. The plutonium bomb Fat Man at 20,000-22,000 tons of TNT would further outpace the scale of destruction caused by any single weapon system in the history of man-kind. Compared to these giants, the MOAB is less than one-thousandth the blast yield. However, looking back at how the MOAB compares to the weapons of WWII helps put the sheer power of this epic bomb into perspective. Tags Allies, Axis, Blitzkrieg, Hiroshima, MOAB, Nagasaki, Nazi Germany, Siege of Sevastopol, Wunderwaffen. 1 ton (metric) = 2204 pounds, not 2240. Because the US dropped the MOAB: 1 US ton equals 2,000 US pounds. The article was not talking metric tons! A British ton is 20 hundredweight. A hundredweight is 8 stone (of 14 lbs each), or 112 lbs. Hence in the RAF a “10 ton” bomb was 22,400 pounds. During WWII , there were 41 Grand Slam bombs “dropped in action”. The MOAB has but “1” dropped in action ( covering this 75 year period )… Interestingly, the bomb load of the WWII Lancaster bomber, could easily have carried the MOAB ( barely any difference between their weight ).